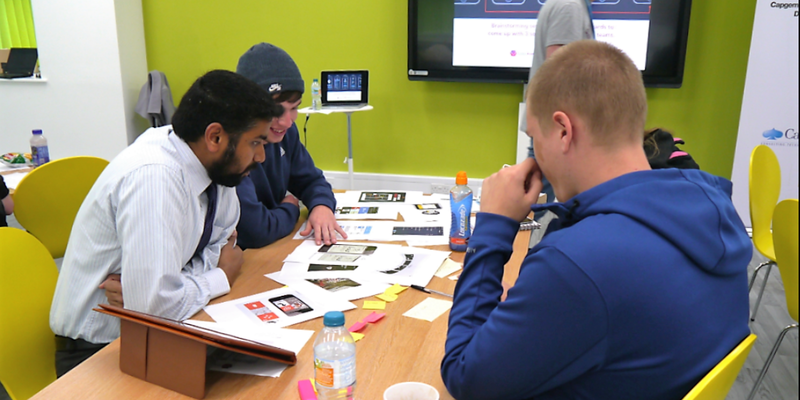 As part of Capgemini’s ongoing Digital Partnership with youth charity The Prince’s Trust, an interactive digital skills course was held for underprivileged young people in Cardiff last week. The event was the first STEM course of its kind for The Prince’s Trust in Wales and was part of a series of programmes designed to provide them with the skills required to succeed in today’s digital economy. Get Started with Apps is an introductory week-long course, which gave 10 young people a taster of the various skills required in today’s digitally dependent workplace. Attendees learned how to create their own mobile app; taking it from the ideas stage, to wire-framing, consideration of data sources, writing code and building a prototype. They also explored virtual reality kits and Internet of Things devices and games, with a view to broadening their scope of learning. The young people worked in teams throughout the week, which culminated in a presentation of their app last Friday to an audience of VIPs and senior executives – including representatives from Capgemini, The Prince’s Trust and other leading influencers, such as Microsoft. The work with The Prince’s Trust is part of Capgemini’s commitment to raise the standard of digital skills for all, as well as to promote social mobility. Its study into digital literacy and the potential impact on businesses found that 57% of employers in Wales believe that young people are very digitally savvy, but don’t know how to use their digital skills for work purposes – putting young people at risk of missing out on their dream job. Andy McDonough, Capgemini’s Welsh Government Senior Account Executive said: “At the heart of our programme is our desire to support digital skills for everyone in the UK. The reality of today’s digitised economy is that many young people do not have the opportunity to develop these vital digital skills – putting them at a disadvantage both in their career and in life. With a view to helping plug the UK’s STEM skills gaps by nurturing young talent, our programmes are not solely about creating tomorrow’s leading technology specialists but also about improving young people’s life changes through stronger digital skills. For this reason, our courses also focus on many vital workplace skills, including team work, presentation skills, critical thinking and innovation.